Sturdy anodized aluminum extrusions are a long-lasting alternative to plastic! Ships knocked down to save on assembly and transport costs! 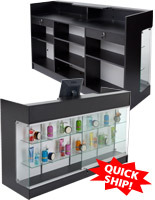 Adjustable shelves offer display options! Economy displays are crafted from affordable melamine panels! 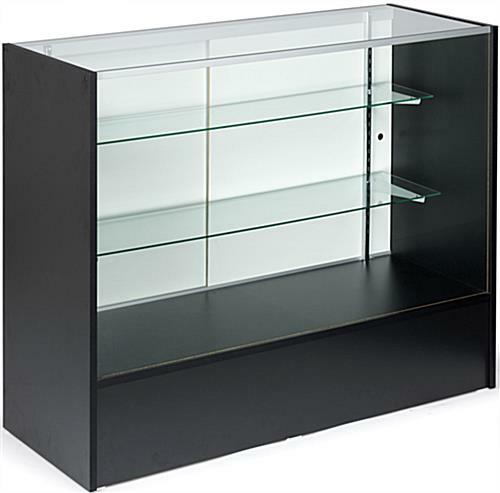 This display case is a great choice for any retail location looking to keep expensive or fragile items clearly on display in a case. 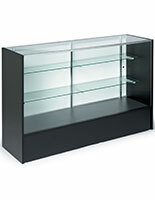 The display showcase, display case is a jet black case, sure to complement any décor. The case can be used in a wide variety of retail establishments, including boutiques, jewelry stores, gift shops, department stores, and more. 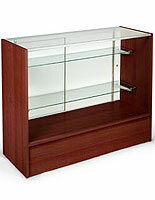 This display case is perfect for selling candy at a movie theater or displaying sports memorabilia or a trophy collection in a Hall of Fame or even a high school lobby. 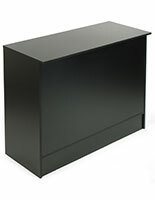 The case is great for setting a barrier between customers and retail associates. The case features rear sliding hardboard doors to allow easy access for sales associates to retrieve case items for customers to view. Besides sliding doors, this display case has many more great features. 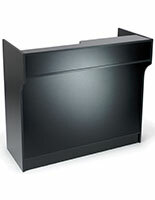 The display showcase features anodized aluminum extrusions, offering a sturdy alternative to plastic extrusions used by many other case models. 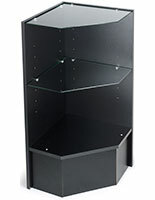 Adjustable shelves allow products of varying heights to be showcased within the case. The display case is crafted from melamine panels. This construction is an affordable and durable alternative to real wood cases. Plastic feet are also included. The vertical area offered by this display case is a great way to showcase a large amount of goods in a relatively small area. All glass surfaces of this case are crafted from tempered glass. 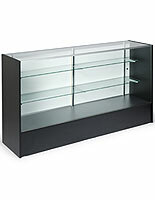 This display case, also known as a trophy case, is shipped unassembled to save you money on warehouse assembly, and the high cost of shipping a fully assembled display showcase. This also saves you time, as this case will ship out today if you order by 3PM EST, compared to a 2-day wait for a fully assembled display case. We have created an easy-to-follow assembly video to aid you in assembling the display case yourself. Assembly is simple, but does require 2 people.